Bonsai Village (盆栽町) is located in Omiya. It's a village of Bonsai. 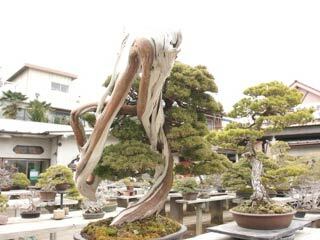 There are many Bonsai Gardens and the village itself takes the design and art of Bonsai. You can enjoy traditional Japanese beauty in this village. At the Bonsai Garden, keep these manners. 1. use Tobu Noda Line to Kita-Omiya (2 min.). Bonsai Village was formed after the great Kanto Earthquake in 1923. After that disaster, many Bonsai artists and craftmen moved to Omiya. Those Bonsai lovers made a rule in this Bonsai Village to make this village specialized for Bonsai. - Everyone must have over 10 Bonsai. - Everyone must open the gate to their gardens. - No one allowed to built 2 or higher stories building. - Everyone must have living fences. Today, 11 houses opened their garden as Bonsai Garden. They show their Bonsai as the traditional Japanese beauty. ... is a Japanese traditional art form using small trees grown in small container. Small tree does not mean young tree. Most of them are over 50 years old, and sometimes there are over hundreds years old. Bonsai uses cultivation techniques like pruning, root reduction and adjustment, potting, defoliation, grafting, and wire-straping to create small trees. Because it takes long time and ever finishes in one's lifetime, it is considered as the life time hobby. However, Bonsai lovers and artist say, "it's not hobby, it's taking care of your life time partner." Bonsai represents the one's universe and season in private space. - When you see Bonsai, see it from the lower angle. Think that you are became a dwarf and traveling a mountain. - Watch Hachi, the container. It's shape, size, color of Hachi is very important. Bonsai uses small Hachi (because large Hachi is hard to keep soil warm, and roots grows too much which effects the growth of its leaves.) but the tree growth strongly and widely which represent the strength of the nature. - When the roots get tight and strong, tree also becomes very strong, and grows beautiful leaves and flowers in each seasons. - Trees grows very slow, but the process of taking care of tree gives you a lot of pleasures into your heart. - Bonsai is not letting tree grow bigger and wider, but keeping it small and tight. This is like teaching a tree manners and honors. Growing small Bonsai is much harder than having big Bonsai. - Try to make a poem with Bonsai. The emotion which you want to express though Bonsai is the art of Bonsai. Each Bonsai has its poem. So, when you watch Bonsai not only watching it, but also listen to it what it tells you into your heart.